On August 9th, PBA Galleries in San Francisco will hold an auction of Fine & Rare Books – Art & Illustration – Asian & Asian-American Material featuring The Bret Sharp Collection of Books in Early Dust Jackets. On offer, will be over 600 lots of rare books, illustrated books, children’s books, Asian art books, and more. The main section of the auction ranges from early printings of legal and religious texts to 20th century scientific works, finely bound books and sets, fine printing, literary ephemera, and more. Art, illustration and children’s books, from Baum and Beardsley to Rackham and Rivera, are followed by a selection of East Asian art and illustrated books, primarily from China and Japan. The use of printed dust jackets to protect and market books was largely an early twentieth century innovation in publishing and for collectors of modern books the presence and condition of the dust jacket can have an exponential effect on the value of a book. The most extreme example perhaps being F. Scott Fitzgerald’s The Great Gatsby, a copy without a dust jacket is offered in this sale with an estimate of $2000/3000, if the dust jacket were present and in very good condition, we would estimate this volume at more than $100,000.00. Despite the late popularity of dust jackets, numerous earlier examples exist. The Sharp collection brings together scores of early dust jackets on classic literary and historical works. 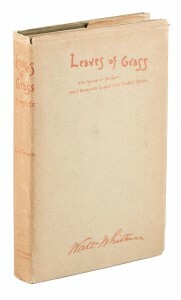 A copy of Walt Whitman’s great poetry collection, Leaves of Grass, with a copyright of 1891 but believed to be an undated printing issued in 1896, is offered in a very early dust jacket. Although unrecorded, it is perhaps the earliest jacket known for this work (Estimate: $7,000-$10,000). An Object of Pity, or, The Man Haggard [with] Objects of Pity, or Self and Company by A Gentleman of Quality written by Robert Louis Stevenson and “Many Competent Hands” are both in French fold parchment dust-wrappers. Privately printed with a speculated edition of only 35, it is perhaps the most unattainable of Stevenson’s works (Estimate: $5,000-$8,000). An early American edition of Jules Verne’s Around the World in Eighty Days, c. 1878, in the original terra-cotta colored cloth pictorially decorated in black and gilt is offered with the original publisher’s printed dust jacket (Estimate: $4,000-$6,000). Highlights from the Asian section of the sale include the massive overview of East Asian art, “Toyo Bijutsu Taikwan” [The Collection of the Eastern Arts], in sixteen massive volumes with numerous plates, some color, presenting an overview of historic east Asian art and artifacts, published in 1919 (Estimate: $15,000-$25,000). 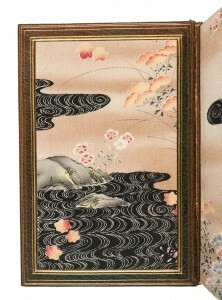 Captain F. Brinkley’s The Oriental Series: Japan & China, 1 of 50 sets of the Viceroy Edition printed on Japan Vellum. This edition is elaborately illustrated with inserted plates, some colored and many on silk and bound in period full green morocco, elaborately stamped in gilt with a floral motif (Estimate: $2,500-$3,500). 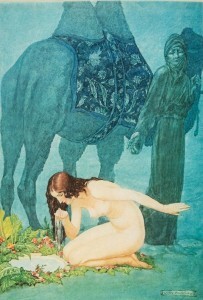 Other featured items include: Willy Pogany’s illustrated edition of the Rubáiyát of Omar Khayyám, 1930, limited to 1250 copies signed by Pogany, bound in full morocco tooled in gilt (Estimate: $1,500-$2,500); Marcel Gromaire’s striking livre d’artiste of Shakespeare’s Macbeth, with 20 original etchings, limited to 200 copies signed by the artist (Estimate: $3,000-$5,000); A Defence of M. Perkins Booke, Called A Reformed Catholike, 1606, by Anthony Wotton, the English Puritan clergyman and controversialist (Estimate: $1,500-$2,500); and Trigonometria Artificialis, by Adriaan Vlacq, 1633, the first table of logarithmic trigonometric functions, containing the logarithmic sines and tangents to ten places of figures (Estimate: $1,500-$2,500).